Location: Herstmonceux, East Sussex, England. Ownership / Access: Queen's University. 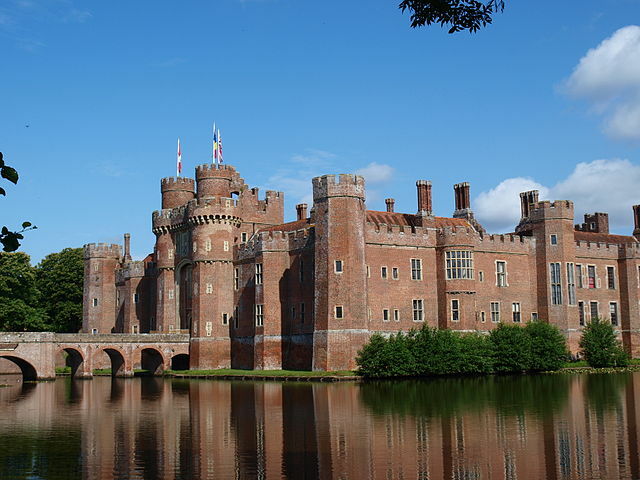 Notes: Herstmonceux Castle is a brick-built castle near Herstmonceux, East Sussex, England. From 1957 to 1988 its grounds were the home of the Royal Observatory, Greenwich. Today it is used by the Bader International Study Centre of Queen's University, Canada. Herstmonceux Castle is one of the oldest significant brick buildings still standing in England; brick was an unusual material for the time in Britain. The builders of Herstmonceux Castle concentrated more on grandeur and comfort than on defence. Herstmonceux Castle is home to events throughout the year, including the annual England's Medieval Festival on August Bank Holiday weekend.